If you search the word “vinyl” in Google, you don’t exactly find any fence results. Why? Because back in the day, vinyl was used a lot for producing musical records. These large vinyl discs were used to play beautiful music on turntables or record players back before. And while vinyl is now used for many other things besides musical records. Vinyl fencing still isn’t exactly what springs to people’s minds when they think of fence installation. That said, we had to dedicate a page to it. There are so many reasons why it’s a great material that we’ll get into further down on this page. 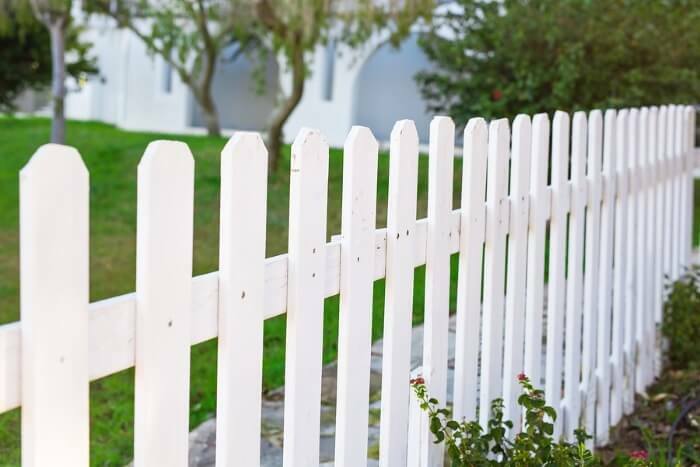 If you’ve ever had a great vinyl fence installed, you’ll know what we mean. So What is Vinyl Fencing? Vinyl is also known as Polyvinyl Chloride or PVC. Its a synthetic plastic polymer with some pretty great properties. PVC is used primarily in the construction industry. Where it’s estimated between 70% and 75% of all PVC is deployed. The reason why it’s so prevalent in the construction world. And that includes fence building, is partly because it’s extremely strong. Experts say about five times stronger than wood and it’s not biodegradable. This means it’s impervious to common fence issues like rot, bugs, insects, rust and so on. This doesn’t make it better than a well-built wood fence or a quality chain link fence. It just means it has certain advantages. It’s also flexible and more durable than wood. Due to its resistance to the harmful effects of moisture and it requires less maintenance than a standard wood fence. There is a multitude of different forms of PVC fences available depending on your desires, requirements, and budget. Vinyl fences have the potential to have better longevity than many other fence materials like wood or chain link. Especially in harsh weather or very humid environments. Here in Paterson, NJ, we get snow, ice, wind, rain, and so on. And that makes vinyl a pretty great choice depending on what you need it for. A big bonus is that vinyl tends to be a cheaper material than the other fencing materials as well. So if you’re looking for something on a tighter budget, it might be the perfect solution for you. For a quicker answer to your vinyl fencing question simply give us a call and ask away. We’ll be more than happy to provide all the information we can. Due to its synthetic nature, vinyl is highly customizable in both styling and color. There are so many ways it can be made to match your desired look and performance. If you’re looking to create the perfect balance of colors at your home, you can pick and choose your colors to create contrast, to provide subtle framing, or anything else you want. You can even choose to stick with the standard smooth plastic look or you can choose any of the other surface finishes available. It’s all up to you. We know we’ve been talking up vinyl fences a lot, but that’s because there are just so many situations where they’re perfect. Other fence materials are awesome as well and absolutely have their place. All in all, we’re lucky to have the right material to fit any job, whether you want vinyl, wood, or chain link. Whatever it is you need, with our tools and experience, we are always ready to help. Together we can build you the perfect fence for you.